JFA Executive Director, Steve Wagner, talks with students at George Mason University (Oct. 17, 2018). Our team has been busy in GA, KS, MN, VA, and TX recently, and we’re preparing for upcoming events in OK, MO, CO, and TX. 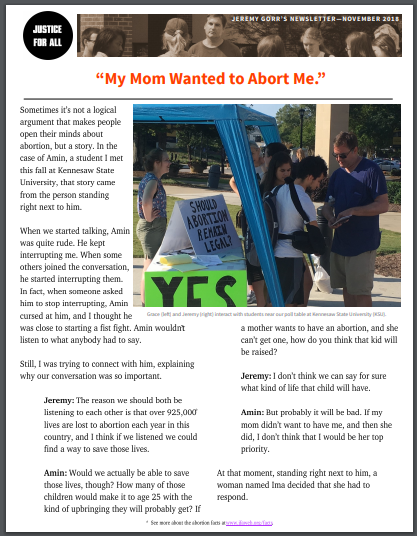 Please pray for the many conversations we’re creating, including the one described in Jeremy Gorr’s letter, “My Mom Wanted to Abort Me.” We thank God for the change Jeremy was able to see take place in Amin’s life.